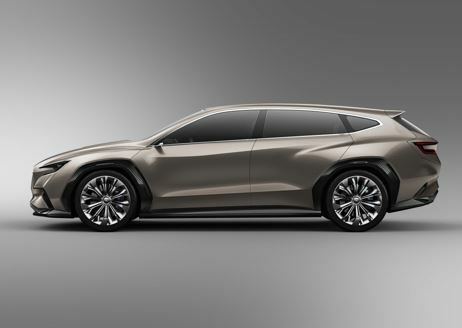 Since the debut of the Subaru VIZIV Concept in 2013, Subaru has produced a series of themed concept models embodying the brand’s vision for the future of making cars that deliver Enjoyment and Peace of Mind to its customers. Designed on a tourer theme, the Subaru VIZIV Tourer Concept unites Symmetrical AWD layout powered by a boxer engine with Subaru’s wealth of expertise in offering driving performance, practicality, and safety to deliver new value in a tourer form enabling drivers and passengers to fully savor the enjoyment of travelling by car. In anticipation of widespread future deployment of automated driving technologies, advanced driver-assist functions combining the next-generation EyeSight system with other devices have been installed in the car to reduce driver fatigue on long journeys and enable active enjoyment of driving with peace of mind.